Herzig, Alison Cragin. 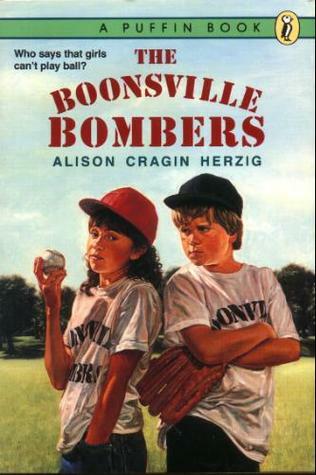 The Boonsville Bombers (published in 1991 by Viking Penguin, a division of Penguin Books USA Inc. of the Penguin Group, 375 Hudson St., New York City, NY 10014). Ten year old Emma Lee Benson lives in Boonsville with her mom, dad, and older brother Michael who’s in the sixth grade. Mike has a baseball team with his friends Joe, Spike, Ben, and Weasel called the Boonsville Bombers. Emma’s dream is to play on the team. She’s been working hard practicing pitching and catching, but Mike and his friends, especially Joe, won’t let her play. Joe has the only bat and says if Emma plays, he’ll take the bat and leave. Then Emma gets a present from Aunt Esther. It’s a box of old baseball cards, including a rookie card of Owen Zabriskie who is all the kids’ favorite player. Emma comes up with a plan to convince them to change their minds. What will she do to get Mike to allow her to play? How will the other guys react? Will they ever let Emma be on the team? Sigh! I suppose that one could consider The Boonsville Bombers just another propaganda tool to brainwash children into thinking that there are simply no differences between boys and girls. If there’s a “historic black college,” there’s nothing wrong with that, but if there would be a “historic white college,” that’s racist! If girls want a team of their own, that’s fine and dandy, but if boys want a team of their own, that’s sexist! Yes, I know that boys should be nice to girls, treat them kindly, and not bully them. If that’s what kids get out of this book, then I guess it’s all right. In that respect, there actually is a cute story here, but I must admit that I do get a little tired of all the constant gender-baiting. As to language, some common euphemisms (gee, darned, gosh) occur, but no cursing or profanity. This entry was posted in general youth fiction. Bookmark the permalink.